My exploration state of the design for a strong box to carry the Honda EU2000i continues. 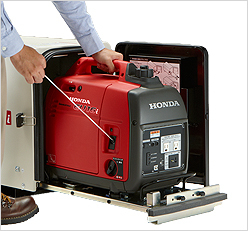 The discovery that Honda makes and sells a line of silencer enclosure for their line of generators in Japan helps my design goals greatly. When I finished filling the potable water into Brunnhilde's water tank, I proceeded to replace the filler cap and lock it. To my surprise the lock cylinder popped out when I withdrew the key. This post is mostly photos of the dishes that I made recently.